Ever wished you hadn't lost control of your words, or your time, or your temper? Ever resolved not to do something ever again, only to slip back after a week or a month? Self-control. It's every man's greatest challenge. The Bible says that a man without self control is like a city without walls - defenseless in the face of attack. Lack of self-control is the weakness that lies beneath so many of our sins, from adultery and violence to the way we drive or fritter away our time. 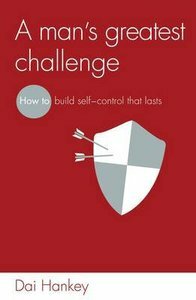 This book will show you why to, and how to, build self-control that lasts. In showing you what the Son of God has done for you, and what the Spirit of God is doing in you, it will equip you to become the man you want to be, and the man those around you need you to be. It's time to start building. About "A Man's Greatest Challenge"
Dai Hankey is a church-planting Pastor in the Welsh Valleys where he lives with his wife, Michelle and four young children. Dai is a former skate-boarder and loves to DJ. He is the author of The Hard Corps and A Man's Greatest Challenge.